We are currently out of women's ski and snowboard jackets, but here is a selection of items that may interest you. Enjoy a day on the slopes with women's snowboard and ski jackets from Athleta. With women's snowboard and ski jackets from Athleta, you'll stay warm and dry on the slopes without the bulkiness of extra winter insulation. Modern ski and snowboard jackets are made with high-tech material, like INSUL8™, which keeps you warm without hiding your figure. Our jackets are water resistant to keep you dry on those early- or late-season runs, and wind resistant to keep you from freezing on some of those long chairlift rides. 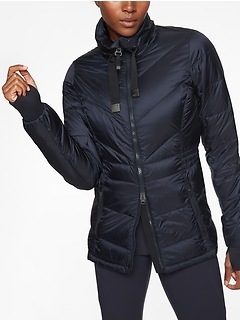 Whether you're an avid skier or snowboarder, or just looking for a fashionable winter coat that can handle the worst of the blustery season, you'll find a selection of well-designed snow jackets at Athleta. Puffy down coats are great for keeping you toasty, but they can be a little too bulky for outdoor activities. Plus, the bulky look isn't always flattering. 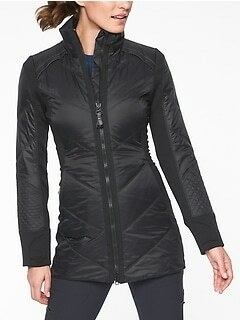 Downalicious™ skiing and snowboarding jackets from Athleta are a wonderful upgrade on the traditional down coat. Made from nylon, goose down and INSUL8™ material, these fashionable jackets feature an offset zipper design which is sure to turn heads on the mountain. If you're looking for a more traditional look, select a Down With It jacket. These incredible coats feature a normal center zipper and an extra comfortable hood. Look great, stay warm and enjoy your time on the mountain with friends and family. Vests are a great alternative to women's ski jackets. They also are extremely versatile garments that can totally change styles based on how they are worn. On nicer days, try throwing your vest over a long sleeve fleece pullover or plaid flannel. When the weather turns nasty, a vest can make any jacket extra warm. 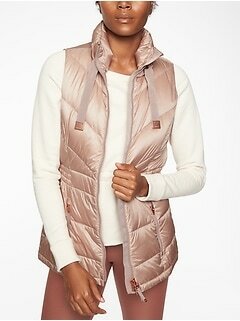 Vests from Athleta are available in a wide variety of incredible colors from stylish black to eye-catching citrine. Mix and match with vests and layers and reinvent your winter look on a daily basis. 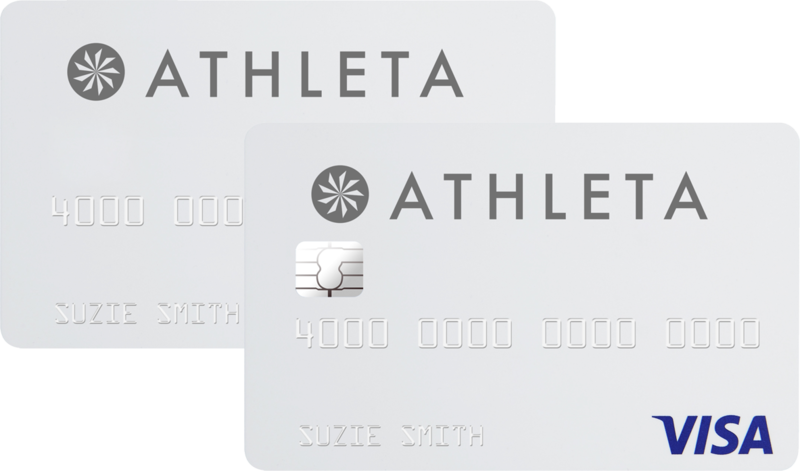 You'll love the way you look while you swoosh down the slopes with a women's snowboard or ski jacket from Athleta.